L.W. 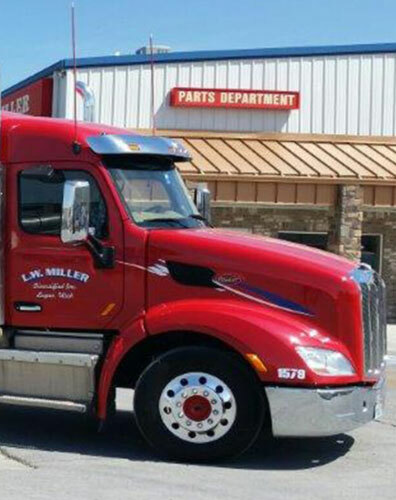 Miller, headquartered in Logan, Utah, operates a fleet of MC407 stainless steel pneumatic trailers servicing the lower 48 United States. Services are available 7 days a week 24 hours a day to serve your liquid tanker transportation needs with superior service and competitive rates. If you need a load delivered across town or across the country, we can get it there. We have units delivering throughout the United States on a daily basis. Our experienced staff of dispatchers and drivers supported by late model tractors and trailers assure on-time delivery while protecting the integrity of your products. An experience management staff to assist you in your liquid bulk transportation needs. Each tractor is equipped with the most up to date satellite communication equipment that allows us to be in constant contact with every tractor. Tractors are equipped cargo pumps and compressors. A financially stable company with an excellent debt to equity ratio that has been providing excellent service for over 25 years. $5 million dollars liability insurance coverage. We are very proud of our Satisfactory DOT Safety Rating. Our DOT reportable accident ratio is among the lowest in the nation. We can also offer Semi-Pup combinations for delivery in the states of Utah, Wyoming, Nevada and Montana. Request a Quote or call us at 1-800-800-0488 and select option 1 to get a liquid tanker freight quote today! Looking for Tanker Driving Jobs at L.W. Miller?